The first European people who came to the east coast of North America, in the 1600s and 1700s, came for many different reasons, so their settlements were very different from each other. The earliest successful settlement was in Florida, in 1565 AD, when Spanish explorers founded the city of St. Augustine. 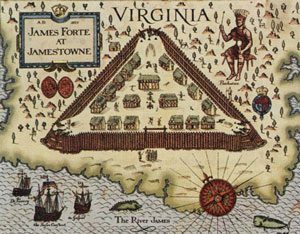 The second successful settlement was in 1607, when English adventurers settled at Jamestown, Virginia. The Paspahegh people who lived in the area tried to push them out, but could not and were defeated. More settlements came soon after Jamestown. Dutch traders settled in New York in 1614 to trade with the Iroquois for furs. 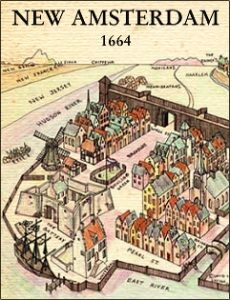 Another settlement was in Massachusetts in 1620, when the Puritans came in the Mayflower from England to live according to their religion. In 1631, more Dutch traders settled in Delaware and made arrangements with the local Lenape people to trade with them for furs. In 1681, a group of Quakers came from England, led by a man called William Penn, and they called the place where they settled down Pennsylvania (Penn’s woods). They pushed out the Lenape people, who spoke an Algonquin language. Florida was English by this time but chose not to participate in the Revolution. Florida stayed loyal to England during the Revolution. Then Florida became Spanish again after England lost the war. Florida joined the United States only under Andrew Jackson in 1821. Cite this page: Carr, K.E. Thirteen states – American history. Quatr.us Study Guides, August 12, 2017. Web. April 23, 2019.